A hallway in David Zaret's house. A walk-in closet designed and built by David Zaret. What do you think of taking a bath surrounded by stone and wood? Zaret uses North American hardwood almost exclusively. He looks for wood grain patterns that capture the eye. David Zaret in his wood shop. 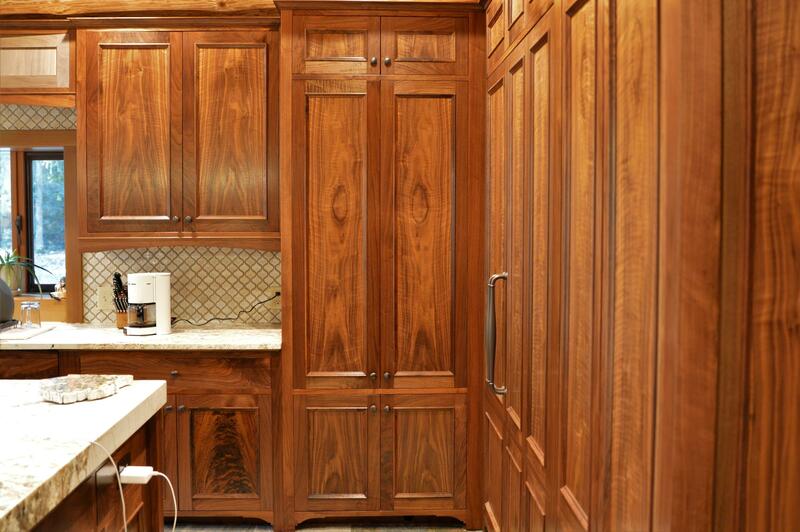 David Zaret builds cabinetry for kitchens, but he started out as a software engineer. “It got to the point where I just couldn’t stare at a screen anymore after 20 some years of doing it. And though I still engineering software and I’m still involved in it, day by day I have to do a physical build rather than a virtual build,” Zaret explained. When he says physical, he really means it. This all started years ago when he bought a century old two-story grey stone in Chicago. “There was beautiful oak trim done by the craftsmen back in the late 1800s. And there was this built-in in a nook in the first floor. In the second floor where I lived –and I renovated the entire place- but in the second floor in the ‘50s there had been a fire and it burned out all the trim and that built-in,” he said. Looking at the unit downstairs and knowing what the second floor could look like, he just kept thinking: one day I’m going to replicate that built-in cabinetry that’s supposed to be there. You don't see the stove or refrigerator in Zaret's kitchen. “It took me the better part of a decade to get my confidence level up, to get my tooling up. I didn’t have any training woodworking at all. I didn’t have relatives in the trade or anything like that. It was a lot of reading, a lot of experimenting, and, frankly, a lot of it is overcoming lack of self-confidence early on,” he said. Since then, he’s done 23 high-end kitchens for friends and family. He’s got definite ideas about what is beautiful. First, he prefers the traditional style. He says he’s doesn’t see anything wrong with the Euro-style that’s become popular, but that’s just not his thing. Second, he really doesn’t think you should see the appliances when they’re not in use. He builds doors that open and slide back to access the oven and stove, you don’t see the refrigerator. What you do see are basically floor to ceiling beautiful wood panels. Finally, he doesn’t like to waste the hardwoods he uses. Why use a more than absolutely necessary? “I do a lot of veneering and I buy from a veneer dealer in New York state that specializes in really high-end veneers. But I try to stick to North American hardwoods. We are blessed to have some of the most fantastic trees in the world here or close to us in Canada. And I don’t see any reason to be taking down any rainforests. I just don’t,” he said. Veneer maximizes the value and the volume of a given tree. Plus, those thin slices from the same tree can be book-ended so that the pattern on one door is reflected in the opposite door. Think: butterfly wings. Zaret saves the lumber he can for use in his pieces. Zaret also buys a lot of local urban lumber. When somebody is building, sometimes trees are taken out. He says it’s mortifying when those trees just get put in the chipper. So he mills it himself or he has it milled. I asked him a question I ask a lot of artisans: does he see the flaws in his work after it's finished. Like everyone else who answered, he sees the things that no one else would notice. But he doesn’t think about it that much. Zaret planing a piece of substrate. He'll adhere high-end veneer to the surface later in the process. piece for the next job? That’s the stuff that I really like. I think I’m an engineer more than an artist,” Zaret said. He’s still using his computer skills to design the tools and program certain woodworking equipment. That engineering gene didn’t disappear, it’s just evolved into making cabinetry and casework that is stunning precision work. “I’ve not found a better combination of engineering and artistry,” he said, smiling. David Zaret is our latest Artisan of Michigan.